> Piece was cut from a tree approximately 12 years old that was felled in July 2008 and has been naturally air drying since then. > Photo is of one of the actual pieces, and we have plenty in stock. 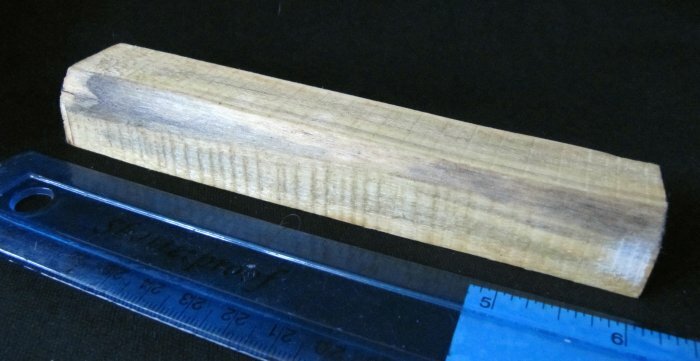 Last photo is a sample angle cut from a small notch in the same tree to show more of the grain color of the tree. Russian Olivewood is an excellent choice for woodworking projects such as woodturning, carving, pens, handles, making small figurines or to gradually use as stock for small projects and insets. Highly prized for its beautiful coloring and exceptional grain, Russian Olivewood is a favorite of woodworkers. The wood is hard and strong, and has superior working characteristics, making it well suited for wood turning, splicing and carving.